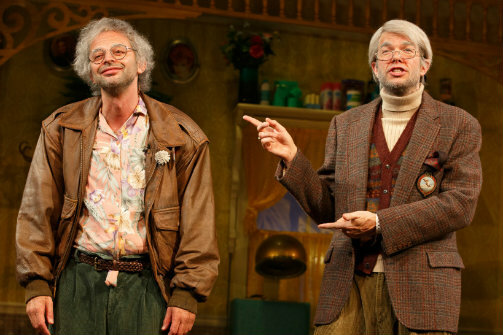 Nick Kroll and John Mulaney in Oh, Hello on Broadway. Photo by Joan Marcus. BOTTOM LINE: Comedians Nick Kroll and John Mulaney bring their cantankerous, septuagenarian alter-egos Gil Faizon and George St. Geegland to Broadway, with lots of laughs, ballet, and too much tuna. Broadway doesn’t seem to have a lot of love for comedy outside of musicals, which makes Oh, Hello's arrival there all the more remarkable. After a long journey from comedy clubs such as the late Rififi, to a recurring sketch on Kroll’s eponymous Comedy Central show, to the Cherry Lane theatre last year, it’s a well-deserved arrival, with the two comedians having created a full meal out of what started as a sketch. Gil (Kroll) and George (Mulaney) are long-time roommates living on the Upper West Side. Gil is an actor and voiceover artist who once almost became the voice of CBS. George is a writer with an unpublished novel, Next Stop Ronkonkoma, about a trip on the Long Island Railroad from 100 different perspectives. In their world, the duo mispronounce words like "dialergue," and "flush forward," and they’re obsessed with Steely Dan and Alan Alda, from whom they’ve received a restraining order. With nothing much going on professionally, they have lots of time to compile an endless list of things to voice their scathing opinions on, from Guy Fieri’s "garbage fire" of a restaurant to Werthers, the "Amber Alert of caramels." Even Broadway gets zinged, including the obligatory Hamilton reference. They’ve also written a play for themselves—which they perform. In the play-within-the-play, Gil and George receive a letter from their landlord informing them the rent on their five-room rent-controlled apartment is about to go up thousands from the current $75, an increase they can’t afford. They go through how they met, complete with cheesy music cues; when one is missed, George, who is more than a bit of a crazed bully, goes nuts on their unseen, much-abused intern from NYU, Ruvi. They then reminisce about their old cable access show Too Much Tuna and do a last episode, joined by a special guest (Late Night’s Seth Meyers, the night I saw it) for a bit of ad-libbing, and then eventually by what could be called "tuna ex machina." Kroll and Mulaney are great fun to watch, and their affection for each other and the characters is evident, no doubt because the comedians have known each other since Georgetown. There’s no staleness or boredom despite them having portrayed the grumps for over a decade. Alex Timbers, who has helmed such diverse offerings as Rocky and Bloody Bloody Andrew Jackson, uses a light touch, letting his funnymen and their antics loose whether they’re doing crowd work, improvised comedy with the guests, or a ballet through dry ice. The rest of the team does a stand-out job with the intentionally hideous costumes and vibrant sets full of tchotchkes, allegedly re-used from other productions like the 2005 production of Steel Magnolias. 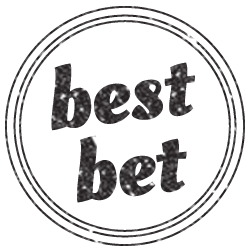 Oh, Hello will be best appreciated by New Yorkers, comedy nerds, and fans of the theatre; some of the references—to the Lillian Hellman Fund or Judith Light—may go over the heads of others. But as evidenced by the hysterical howling going on around me, most everyone will be walking out cracking up. Like an amazing tuna sandwich that is as elusive as the Z train, Kroll and Mulaney have crafted a tasty sensation for the new Broadway season. (Oh, Hello on Broadway plays at the Lyceum Theatre, 149 West 45th Street, through January 8, 2017. The running time is 90 minutes with no intermission. Performances are Tuesdays through Fridays at 8; Saturdays at 2 and 8; and Sundays at 3 and 7. There are some schedule changes throughout the holiday season. Tickets are $59 - $149. To purchase tickets, call Telecharge at 212-239-6200 or visit telecharge.com). Oh, Hello on Broadway is written and performed by Nick Kroll and John Mulaney. Directed by Alex Timbers. Scenic Design by Scott Pask, Costume Consultant is Emily Rebholz, Lighting Design by Jake Degroot, Sound Design by M.L. Gogg, Wig Consultant is Leah Loukas and Makeup by Annamarie Tendler Mulaney.